This thread is for comments about our Helltooth Gargantuan Witch Doctor Build Guide. how does the compass rose and the travelers pledge compare to using a hell fire amulet with convention of elements? I've seen people using both setups just trying to figure out if there is a major difference since it was not mentioned in the guide. The Endless Walk set in place of Hellfire + CoE should do alright. You have to make a conscious effort to remain more static in fights though, and this playstyle depends on dodging while fight a fair bit. I notice you using Bane of the Stricken in this build. I have been reading this is useless for pets as they do not proc it. So wouldn't it make more sense to use Bane of the Trapped? Is it true Bane of the Sticken is useless for pet builds? I am using Esoteric Alteration for damage reduction and the Compass Rose set as well. Heya, you'll notice Bane of the Trapped is recommended along with Stricken. And while pets do not stack Stricken, YOU do - and the pets benefit from your stacks! 1. What do you reliably stack bane of the stricken with? 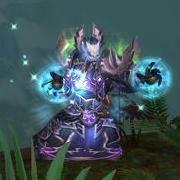 Does WoD communing with spirits proc stricken each time it deals damage? 2. 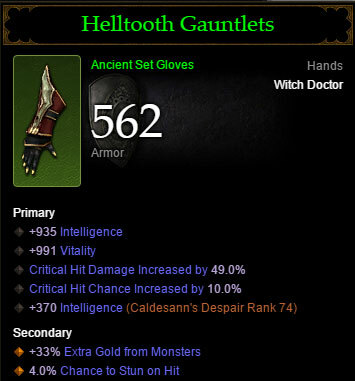 Re: the Helltooth 4 piece: must you apply necrosis, or when your pets apply it (as it says they do in the Helltooth 2 piece description), do you get the 50% damage reduction as well? 3. I understand and have observed that WoD communing with spirits only deals damage along its ring--meaning it deals no damage in the middle of the circle. However, it says it chills "nearby" enemies. Does this mean that it chills (and possible reduces the damage) of enemies who are near the circle but not necessarily taking damage from the circle? 1. Bane of the Stricken is independent of proc coefficients, but does not proc off skills with a proc coefficient of 0% (Damage over Time ticks, Pet attacks) or skills that do not deal damage. It always procs on the first target hit per cast. 2. Sorry if I worded it confusingly in the guide, your pets indeed apply Necrosis of their own. That being said, you are better at finding targets and spreading Necrosis first, so once the pets catch up they can whale away on debuffed targets immediately. 3. It should be chilling everything in the radius, yes. As for the Lakumbra vs Jeram question: Jeram will allow you to spread more Wall of Deaths but if anything breaks through them, you're screwed. 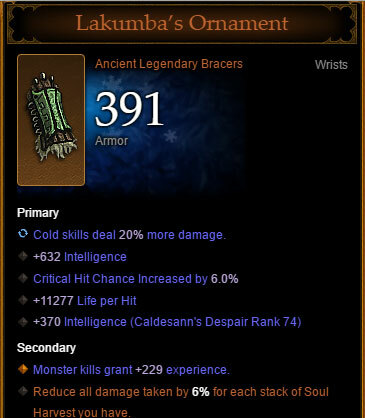 It's a bracer mostly aimed at buffing WoD damage, and the Garg spec doesn't focus on that. Lakumbra paired with Sacred Harvester give you one of the strongest damage AND toughness buffs in the Witch Doctor arsenal, and it's all independent of enemy positioning. Hi. I'm trying to understand how the garg damage is calculated. I have a build focused on pets (helltooth with gargs and zombie dogs) and for the mojo I'm using I am not sure which stat to roll (prioritize on): additional intelligence (by going for the socket and flawless royal topaz) or increase garg dmg%. There seems to be contradictory info on different forums/sites (in some places priority on Int. is mentioned (like here), while on others they mention increase garg dmg% should be priority. Generally, how I've always understood it, priorities are listed from most desired, to least important (but still better than any other roll you can get). Although intelligence is listed 2, it wouldn't be advantageous to roll a socket for only an additional 250 int. If a socket is preferred, it will state that in the state priorities. You're better off rolling a socket to gargantuan %, so long as the previous stats that are listed prior are already rolled on your gear. Hope that helps. Hello! In your case, Gargantuan damage would be more beneficial than socketed Intelligence; if I were to imply additional Intelligence is needed through a Socket, I would list it as 'Socket (Flawless Royal Topaz)'. Thank you very much for this built as i came back from a 2.5 year break and everything changed so much. I followed your guide on this built by the book (at my best ability) and currently still trying to refine some gears into ancient and/or some of the equipped are not to its optimum based on priority. would the uhkapian serpents be a good alternative. for the 30% dmg reduction? - On the set pieces: the shoulders are lacking, missing a Vitality roll and an Area Damage roll; the gloves will also be better with Vitality instead of Armor. - Missing so much elemental damage is a big culprit. 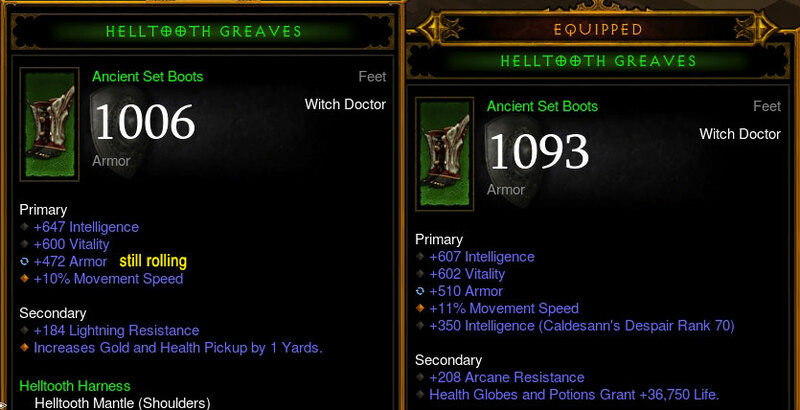 The Hellfire has a good passive to somewhat offset it, but definitely get bracers with Int/Vit/Cold/Crit Chance. - Rubies have been heavily nerfed in terms of experience farming, so I'd definitely not use them in the helm over a Flawless Royal Amethyst for the Life %. - More Paragons never hurt! Is there an elegant solution to dealing with breakable objects with this build? When not in combat, it seems you have to burn the Piranhas or Wall cool down to break anything. It's a very solid and enjoyable build, but I have a feeling I'm missing out on loot when not doing Greater Rifts. Sadly that's the case. :( Breakables are the bane of the build. Many thanks! Awesome...this is super valuable! P.S. Sorry for the late reply...Didn't get any notification that someone replied to my post and also got hooked up with other stuff the past month. Great. Many thanks for the help! A tweaked version of this build has more speed farming viability than the Arachyr build in the speed farming page. Quite a fair bit of leveling since I last touch base on the progress. I took your advise seriously and made some few changes. I found one with VIT roll but sadly no area dmg roll. But found a cooldown attr instead. Even found replacement which i need your advise whether should i change or not. That means a re-augment again too. Please advise. Note: still rolling garg attr so please ignore. Utterly confused. Found a replacement recently but didnt get the exact roll. hence have to re-roll the skill attr to armor hence sacrificing the movement speed sad to say Should i change this? ** note: still rolling armor attr. You were right on elemental dmg. I replaced the old bracers with ancient one (still no luck with perfect roll so no INT :( ). The elemental dmg brought a whole new level on this. With this, i feel like replacing the INT attr with cold dmg too on the hellfire. Just have to grunt and grunt again. 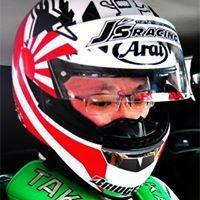 What do u think? Can't think of anything that can give cold dmg anymore unless we touch the jewelleries. gargs dying. I swapped chill to the bone with leeching beast. but not much help. Should i swap out my Pierce of Veil to swampland? Can't push G77 solo. not that i cant kill. just cant kill fast enough. Unless you suggest its about time i move to LoN built. Thanks again for your wonderful advise. Hey! Definitely not the time to move to LoN, with the latest buffs Helltooth Garg is king. And you can try Swampland for sure! For some more definite advice - your planner link doesn't load up your character for me, but I saw some 80-ish level legendary gems, so I advise you group up a little as a support Doctor and upgrade to 100+. It'll be a noticeable bump in performance, since basically all your gems are independent damage multipliers now. Swap ZDogs for Haunt and place on mouse. Cube Wormwood, Ring of Emptiness, and Mask of Jeram. Endless Walk and Shortman's or HF Amulet, CoE, and Shortman's.